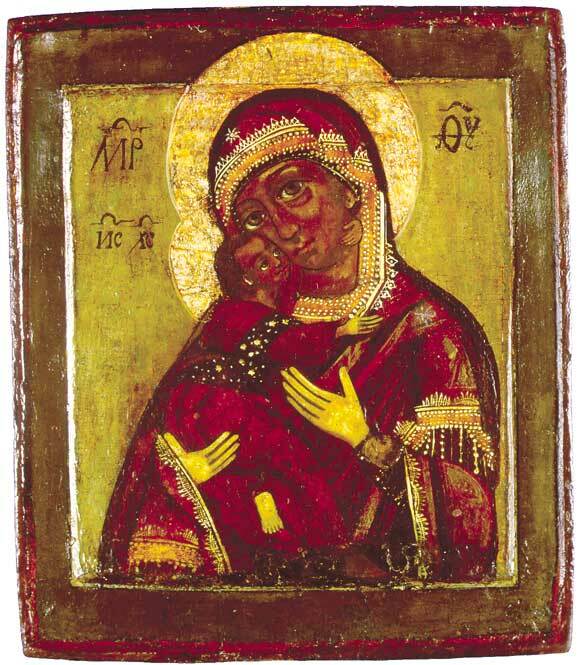 The Vladimir Mother of God is a classic “Tenderness” type icon, so called because the heads of Mary and the Christ child incline in a “tender” cheek-to-cheek embrace. This is the most famous of the icons attributed to St. Luke. It was brought to Kiev from Constantinople in 1155, then taken by the great Prince Andrey Bogolyubsky, during his sacking of Kiev. In 1161, it was placed in the city of Vladimir, from which the name is derived. The Vladimir is said to have saved Moscow from Tamerlane in 1395, and from the Poles in 1612. It is considered a great miracle worker, and consequently multitudes of copies exist. The original icon has been repainted several times and after restoration, only the faces of the Mother and Child remain original. The original icon is displayed at the Tretyakov Museum in Moscow. A bitter battle persists between the Russian Orthodox church and the government of Russia over this and many other famous icons. The Church demands the return of icons which were stripped from the churches during the Communist period. The government insists that they are national ethnographic art treasures belonging to the people. This icon illustrates a more naturalistic rendering, a major deviation from the flat old or Byzantine style icons. Here, both the face of Mary and Christ are rounded and somewhat more three-dimensional. The double raised border or kovcheg (Russian) was common in the 17th century, then gave way to flat painting surfaces. The two large inscriptions on either side of Mary’s head are the Greek abbreviated title for Mary, Meter Theotokos or “Mother of God.” The small inscription to the side of Christ’s head, C XC, is the Russian abbreviated form of the name Isus Khristos - Jesus Christ.